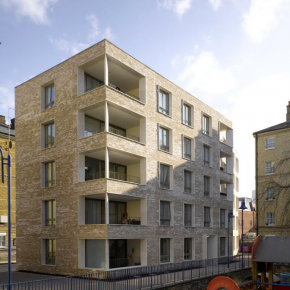 Wienerberger’s Marziale brick has ensured a cost effective, high quality classic look for Darbishire Place in London, completing a show of six housing blocks encompassing an internal courtyard. With aesthetic variation in colour and texture assured, it is an ideal choice that works in tandem with the existing buildings in the development. The existing blocks reach five stories, with repetitive window patterns reflecting their internal layout. The openings are formed with brick reveals painted in white, adding to the unique character. Wienerberger’s clay brick was ideal for the job, meaning the designers could give respectful reference to the neighbouring buildings through the contrast between the external brick skin and other aesthetics, including the deep window reveals throughout the building. The Marziale brick’s bright buff tones are offset by the allure of a weathered, traditional building material. The brick also benefits from clay’s natural longevity, durability, and low maintenance, meaning it is the perfect product for Affordable Housing projects such as Darbishire Place. Richard Brown, Wall Category Marketing Manager at Wienerberger, commented on the project. “Seeing our products used in affordable housing projects like Darbishire Place really drives home what we want to achieve at Wienerberger,” he said. “We know the country is facing issues with housing and some of that comes down to material choice, picking an option that is quick but only solves the issue short-term as opposed to a more long-term solution.